That’s exactly why we’re trying to drum up business. As a not-for-profit charity, every penny you pay us contributes to the charitable aims of the organisation. We provide music-making experiences that are a lifeline for some of the most vulnerable groups we work with who face all kind of challenges in their lives. 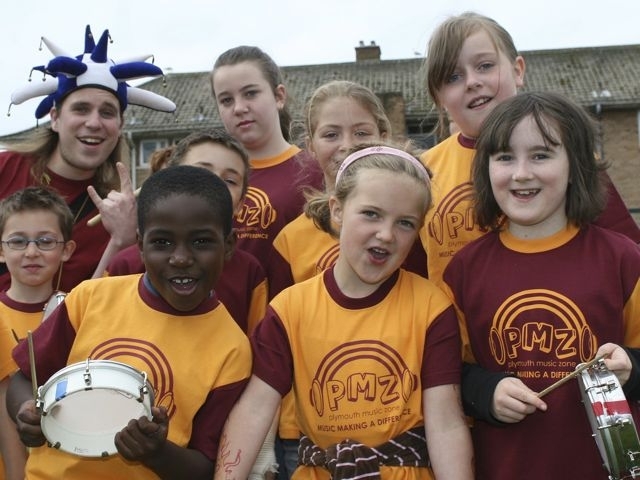 So by having your event at PMZ you're also investing in the future of the people we serve. It's corporate team building with a conscience (and a good old giggle into the bargain...) – now surely that's worth banging on about? Percussion is fabulous. It actually takes very little effort before you start sounding like you know what you're doing. And when you join your colleagues for a Drum Circle you get to experience the real buzz that comes from working together in rhythm - call it a sense of group synergy, co-operation, non-verbal communication, whatever - it's just really great fun! Oooh this is lovely. This is an opportunity to learn the scintillating rhythms of Brazil. Again, it only takes a very short space of time before the group will be playing this vibrant and infectious music - transport yourself from Plymouth to Sao Paolo at the flick of a cowbell…and get whistled at a lot too! Oh yes. Do you remember the days when life was all about singing with the hairbrush in front of the mirror? Well, how about reliving that carefree time - but this time without being forced to look at your reflection? No previous experience of anything musical whatsoever is necessary - but a willingness to join in and have some fun is essential...call us on 01752 213690 and see what we can both come up with.